TUF Gaming motherboards are built to survive and thrive on every battlefield. Infused with the military spirit of The Ultimate Force (TUF) and styled to strike fear into the hearts of every enemy, TUF Z370-Plus Gaming is the perfect foundation for your ATX battle rig: a solid, durable and camouflaged force that’s fit for today’s fights, and with the durability to handle multiple upgrades for the campaigns of tomorrow. Hone your battleskills with exclusive DTS Custom onboard audio. Utilizing advanced emulation techniques to create positional cues via stereo headphones, DTS Custom takes onboard audio to a new frontier. With three presets – Aerial, Soundscape, and Tactical – for different genres, you’ll have a distinct advantage in every game. TUF Z370-Plus Gaming features the very latest Intel Ethernet. Intel’s LAN has the advantage of reducing CPU overhead and offering exceptionally high TCP and UDP throughput for faster, smoother data transfer. Turbo LAN with cFosSpeed traffic-shaping technology adds even more lag-reducing support and an intuitive user interface, so you’ll reduce lag by up to 1.45X – with no expert knowledge. It even includes Game mode to prioritise game-related data transmissions, smoothing network operations every time you play! ASUS OptiMem preserves memory signal integrity by routing memory traces and vias to the optimal PCB layer, and our T-Topology layout ensures time-aligned signaling by balancing trace lengths between memory slots. These enhancements lead to more headroom for overclocking and improved stability, allowing DDR4 memory speeds of 4000MHz with all slots populated – and even beyond! You don’t need to be a technical expert to experience exhilarating overclocking performance. TUF Z370-Plus Gaming incorporates the OC Tuner feature for efficient operation with precise voltage control and monitoring. OC Tuner takes all the hassle out of complex tuning by overclocking your system with a single click – it couldn’t be easier! With backward-compatible USB 3.1 Gen 2 Type-A, you’ll experience ultimate connection flexibility and blazing data-transfer speeds of up to 10Gbps – or twice as fast as USB 3.1 Gen 1! TUF Gaming motherboards are engineered to be as strong and as dependable they appear. 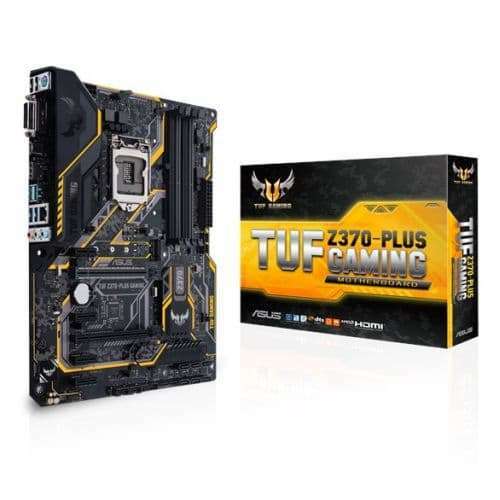 TUF Protection is the name of TUF Z370-Plus Gaming’s hardware safeguards that ensure long-term durability and stability, while the board’s complement of military-grade TUF Components are manufactured and tested to exacting standards – providing the confidence you need to create a gaming system that’ll go the distance.